Lord D and I were shocked to learn that France, the home of haute cuisine, is the second largest consumer of McDonalds food after the US. The tradition of passing down cooking skills in the home has been lost. Possible solution? Make cooking exciting, enticing, easy. Adults who can learn to cook three simple dishes they love, will be able confidently entertain. Children who participate in preparing meals are more likely to eat everything on their plate with a sense of accomplishment that they helped. When you cook together you are more likely to eat together and reconnect. 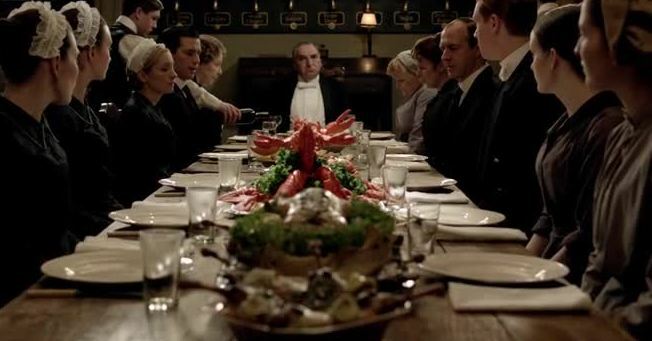 Start Simple for the Love of Downton: My goal has always been to inspire everyone to get back into the kitchen through the love of Downton Abbey. Many of the dishes above can be quite complicated, but two recipes today are easy to pull together and you can take pride in the results. These and many more recipes will be laid out in my Downton Abbey Cooks Entertain ecookbook which should be available in time for Christmas. This is a popular brunch item dish you will find in many upscale bistros, but it will also be served as an appetizer at lunch or dinner. 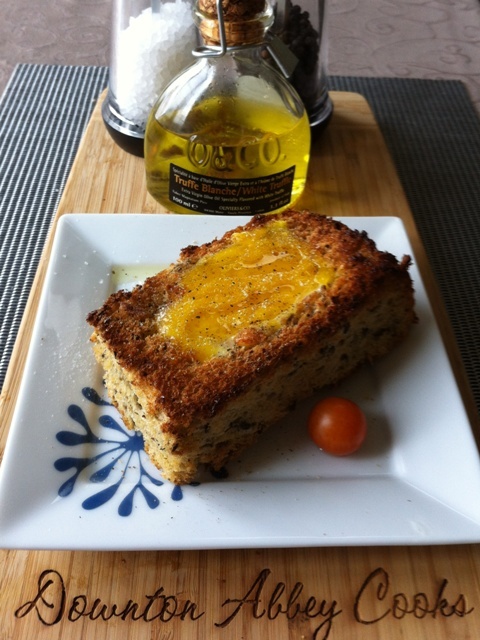 Without the truffle oil, it is very much like Toad in the Hole, which you may be more familiar with. 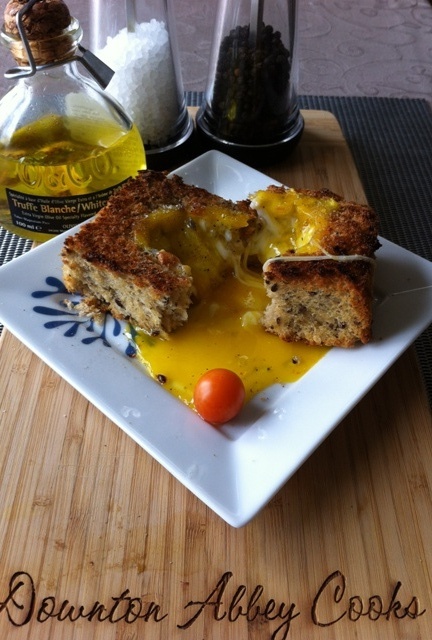 Bake for 3 minutes or until the cheese has melted, the bread has toasted, and the eggs have set a bit. 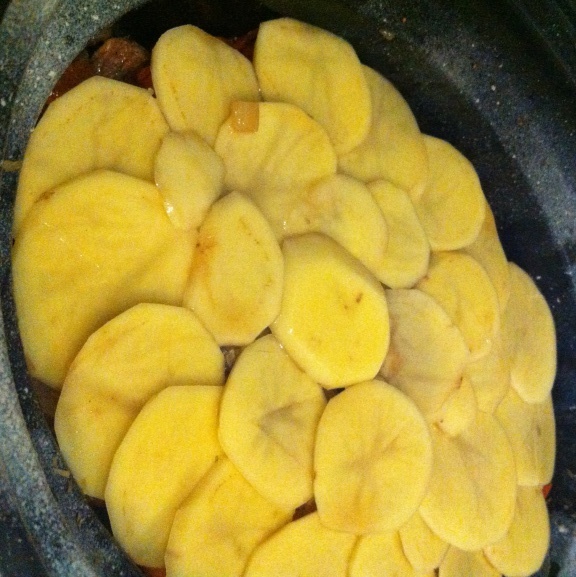 Ready for cooking: Hotpot is a simple layering of lamb (or beef), onions, root vegetables and sliced potatoes. Hotpot is a traditional English comfort food which Daisy would have easily been able to prepare for the Servant’s Hall. There are many regional variations around Britain, which can find in pubs across the UK. Coronation Street fans will know Betty’s Hotpot which now can be found in Tesco. The basic recipe consists of layers of lamb (or beef) and root vegetables (carrot, parsnips, onions, leeks) along with sliced potatoes. Layering continued until the pot was filled, traditionally a stoneware dish. I have other traditional hotpot recipes with lamb, but this is an easy version I prepared in my slow cooker using beef (not everyone likes lamb) for a church supper we had on the weekend. It is a one pot meal which will be ready for you when you get home. I prepped the meat and veggies (storing the sliced potatoes separately in cold water so they don’t darken) the night before and quickly assembled the dish in the morning. Mrs. Patmore did not have a slow cooker, so would have baked with the lid on for 20 minutes at 350 degrees F, then at 300 F for 2 1/2 hours. Finally, removing the lid for 30-40 minutes back at 350 degrees to crisp up the potatoes. 2 tbsp. dried thyme, tarragon or your favorite herb you enjoy with beef. Once the meat has browned, remove, then fry the root vegetables approximately 3-5 minutes. Sprinkle on the flour and cook a few more minutes. Turn Slow Cooker to heat setting ‘low’ and leave for 8 hours. Enjoy and spread the love.